Fun, but $285?? Yikes. I wonder if you could DIY? And finally, in honor of The Rocketeer's 20th anniversary a while back, check out this amazing fan film by John Banana. It's pretty much how The Rocketeer would have looked if Pixar had made it. What's making you smile today, guys? Schneeflink - I just finished Firefly (and Serenity is on Netflix instant watch). the only question now is - what to watch next!!! i just found a new author, yay! Jessica Day George is writting some really great reads. I just finished "Princess of the Midnight Ball" and loved it! Wow, I never thought about how uncomfortable it must be to be a muppeteer. 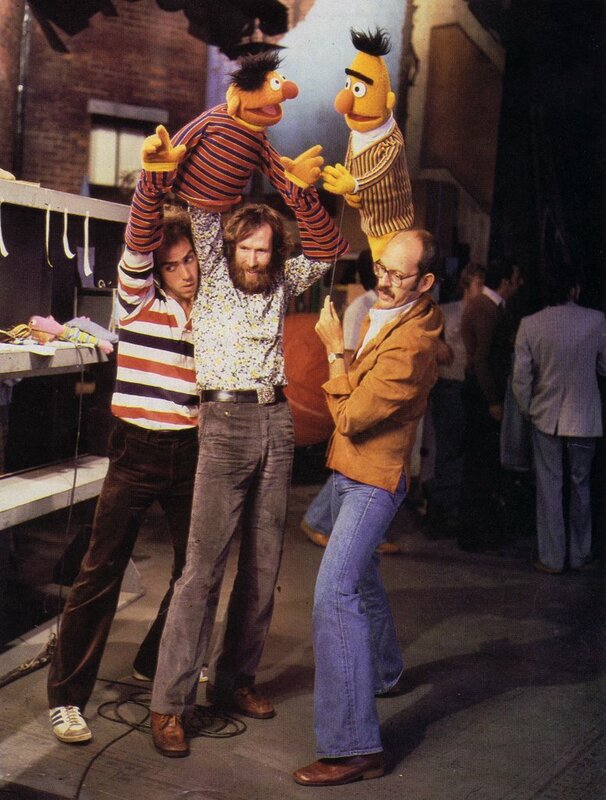 Just look at the poor guy in Jim Henson's armpit. Man - I still miss Jim Henson. What's making me smile (at outright laugh at one point) were these awesome presents that one of my fellow derby moms gave me last night. I was having kind of a crappy day, so it really turned it from junky to joyful in 2.5 seconds. 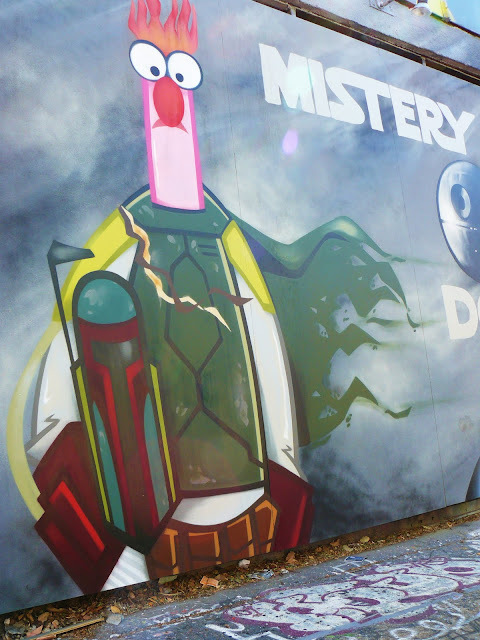 I mean c'mon, Boba Fett BBQ? How can you NOT love that! Your geeky posts always make me smile! But today the main source of my glee is watching my new kitten Sprocket(yeah I loved fraggle rock) play with my older cat Stormy and my pitbull Princess Leia. Hehe. Is there going to be a full length animated Rocketeer? That would be making my day! Another season of Castle is making me smile. Capt. Malcom Reynolds is making me happy now that he has retired to writing crime novels under the pen name of Rick Castle. These "family" stickers, especially the Daleks. And the stormtrooper with the bow. And... Glee is back tonight! Glee Geek. I so want to see THAT version of The Rocketeer!!!! Not sure if you knew this already, but Saturday, September 24 would have been Jim Henson's 75th birthday. Perfect opportunity for some Muppet sweets/wrecks...? I think we should all -- at the very least -- watch our favorite Muppet movies/shows in his honor. Leonard Nimoy wearing a Spock shirt makes me grin! *by happy I mean really happy, 'cuz I am! I was in a major funk yesterday. Then I got behind a mini-van with a "Weasley is our King" bumper sticker on one side, and a "The Whomping Willow destroyed my other car" bumper sticker on the other. Instant mood reversal. I owe a complete stranger for turning around my day. The Bert and Ernie picture tears my heart in two. On one hand, that is an awesome picture. On the other hand, BERT AND ERNIE ARE REAL! Childhood... shattered. Well, I was going to say sunshine... but now it's John Banana!! Totally. Awe. Some! Thanks, Jen! Love the Beaker Boba Fett! What's making me smile today? 2)The fact that Nobel Prize-winning economist Paul Krugman is now using that Demotivational as a shorthand to express his mood! I LOVE Beaker's "Ode to Joy" ornament. His mouth moves and the metronome goes back and forth as he sings - er, mis -- Ode to Joy. I haven't had to check any baggage, just choosing the right song to make someone else feel better somehow makes ME feel better. Bert and Ernie were PUPPETS? I kid, I kid :) What's making me smile? The newest Dr Who episode and that Mainstay Pro (on Youtube)has been filming scenes from the Hunger Games as audition pieces for other actors/actresses. It's wicked cool. We just finished watching Firefly and Serenity; thanks to you and your fans for introducing us to that awesomeness. A three month old Lad named Ben. Nothing makes me smile more than adorable animals! Prepare for a D'awww!!! moment! Jen, I thought of you when I saw this ring. Gorgeous, creative, and steam punk. Perfect! Know what made me smile today? I'm at home, sick, and my hubby emailed me from work just to say he loves me and he hopes I'm resting. LOVE the chicken footprints on the ground in the Rocketeer video. Such great attention to details. Thanks for sharing. @Molly Mouse - don't worry, the fact that they're puppets doesn't detract from their realness. I was at a celebration at the Center for Puppetry Arts (in Atlanta) where Elmo was the guest of honor. The kids were running up and hugging and talking to Elmo, even though Kevin Clash was RIGHT THERE. They could see him, but they didn't see him, if you know what I mean. Elmo was still real. WV: gleume - no need for gleume, even if Bert and Ernie are worked by Peter Sellers. What's making me smile right now is how much I'm enjoying Neal Shusterman's "Skin Jacker" trilogy. What's making me grumpy is that my library doesn't have the third one yet. 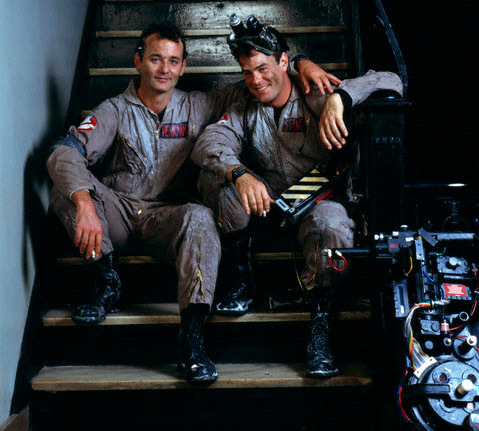 I'm smiling at the thought of the tutorial you'll do after you make the StayPuft costume. Wow. 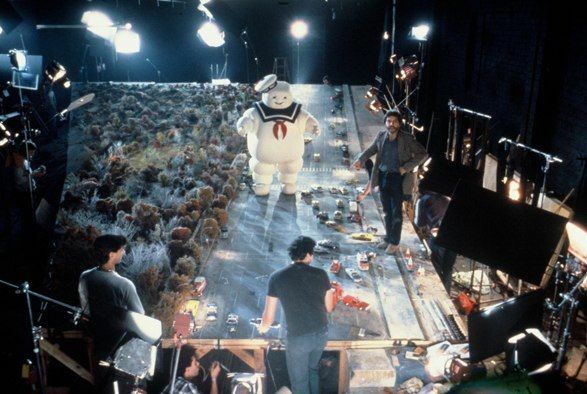 It never occurred to me that there was an actual person in the Stay Puft Man, either. It is actually disturbing to me that I never even wondered how they did it - I just kind of assumed they made a giant robotic one, I guess. Anyway, that picture is completely awesome. What is making me smile, is that my 3 daughters went to a matinee and together. That my son and my husband were laughing together at the dinner table! And that i'm leaving tomorrow to go to Disney World with 3 of my sisters!!!!!! Mary Jane's wv made me laugh out loud, literally'! Alex Dreamz -- Joss Whedon, as in "Joss Whedon is my master now". Or "Thanks, Joss. Now I hate leaves." Has it been 20 years since The Rocketeer came out already? I loved that movie growing up. I just spent several minutes looking at the behind the scenes photos and loved every minute of it. I miss Jim Henson...seeing him at work with Frank Oz brings back so many good memories of my childhood...both Sesame Street and the original Muppet Show. Why can't all television be that good? Hey Jen, I was browsing the Geekery section of Etsy (as always!) and came across these little cuties and thought of you! What's making me smile? I got engaged. In a photo booth. At the LA county fair. I've attached a link to the photos taken while he was actually popping the question. My expression in the first picture is pretty darn hilarious (click on the photo to zoom in).